The practice of yoga has been around for 5000 years, so it has stood the test of time. But its popularity grew in the 1990’s. Now you find yoga in the park, yoga at breweries, hot yoga, goat yoga, and puppy yoga. For me, the best yoga is anything you continue to do. Yoga helps you connect your mind and body, physically and spiritually, with slow deliberate moves and breathing. Muscle Flexibility – Yoga is a good way to incorporate some gentle stretches, which will increase muscle strength and flexibility, and decrease the tension. Reduced tension in the muscles should reduce some of the pain associated with fibromyalgia. Alignment – Proper spinal alignment gives you better support and pain relief. Inner Peace – Yoga can help reduce stress, help you sleep better, and give you a general sense of calm throughout your body. Energy – Strong muscles support stamina, so you don’t fatigue as easily. 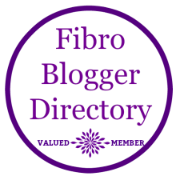 Mindful Awareness – Help fight your fibro-fog! Yoga really helps you focus on your breathing and movements, and helps you stay present and calm. This can improve your mind’s ability to process information. Healthy Weight – It can reduce your risk of diabetes and obesity, and help you lose weight. Healthy Heart – It can reduce your cholesterol, high blood pressure, and stress. All factors in heart disease. Practice makes perfect! When starting out, you will likely not be able to do many of the poses. But they do call it practicing yoga, not perfecting yoga. So do what you can and try some of these easy poses. You can easily search pinterest or google for these poses, or just try some of the videos I mention below, to get started. Child’s Pose – Helps quiet your mind to start your day off right. Mountain Pose – Helps you ground yourself to the “earth”, lengthen your spine, and focus on your breathing. Forward Fold/Bend – Just let your arms and head hang down and feel the tension flow out of your finger tips. Cobra – This helps open your chest and shoulders, and strengthen your back. You may not be able to do this one at first, but start slow and see your flexibility increase. Warrior – This helps you stand tall and work those large muscle groups, and really just feel like the badass FibroWarrior that you are! Savasana – Lie on the floor (if that’s too difficult, just try sitting in a chair first), and with eyes closed and just listen to your breathing. Be present. Wide-legged Forward Fold/Bend – Like the regular one, but with feet wider apart to open your hips and relax your head and shoulders. Just feel the tension flow out of your finger tips. Standing or Seated Spinal Twist – Make sure you do slow, gentle movements. This helps open up the hips and help relieve some hip/back/sciatic nerve pain. Extended Puppy – Similar to child’s pose, this pose helps tension in the shoulders, massages the forehead to stimulate the pituitary gland. Legs up the Wall Pose – This promotes relaxation and helps the circulation in your legs, which is especially important if you get night cramps or have restless leg syndrome. I enjoy working out in the comfort of my own home. For that reason, I frequently watch YouTube videos for my exercise. My favorite yoga channel is Yoga with Adriene. She has a variety of videos for all levels of practice, area of the body, or time of day. Here’s a gentle morning flow to try. Or you can invest in some videos as well. Here’s a link to my favorite yoga mat and some yoga blocks. And I just use a towel or these bands for stretching. Even if your floor is carpeted, it’s always good to have a non-slip mat for some of the standing poses, so that you don’t slip or fall. The idea is to ease your pain, not create more! I know how hard it is to start exercising, especially when it just hurts to get out of bed. But some of these simple yoga moves and breathing are a good place to start. There are many poses, levels of practice, and videos out there. This was just meant to be a fibro-friendly introduction. So the next time you have insomnia, try some of those poses. We certainly can all use a better nights sleep, right? Soon you might surprise yourself, and be sleeping and feeling better, and able to add some additional exercise routines into your schedule. What is your favorite exercise when you are in pain? P.S. I wanted to write an update, 40 days after writing this initial article. Since switching from a regular workout of treadmill or elliptical to daily yoga, I can honestly say that my fibromyalgia symptoms have reduced significantly. While I still get an occasional flare, I was always plagued with that morning stiffness the minute my feet hit the floor in the morning. I haven’t had that problem for many weeks now. I am in love with the practice of yoga now more than ever, as it starts my day on a calm and refreshed note! Namaste. Brilliant. I am addicted to yoga. I began only last October and my progress in 6 months is stunning. I do deep yin every morning for 40 minutes. I could not stretch past my knees 6 months ago it was terrible; now I touch the floor with both hands, easy as pie. My hips are ridiculously flexible now too. But the peace of mind and open-ness with my blogging business are the most fab benefits of doing yoga daily. It opens up bodies and minds, benefiting all of us. Your progress is inspiring! And you are so spot on about our bodies and minds. I truly believe I function as well as I do with my condition, because of my yoga and Pilates practice. Keep up the great work! And thanks for the lovely comments. I’ve been suffering from Fibromyalgia for over 25 years. I started yin yoga over a year ago. I love the long holds & deep stretch you achieve in yin yoga. It’s been great to improve my flexibility, lessened pain & stress levels. I also love the spirituality I get from yin. I’m blessed to have an amazing teacher who is dedicated to her students achieving the best from their practice with the help of soft blocks, bolsters & blankets. Yin yoga really has transformed my life. I can’t imagine my life now without yoga. Wow that sounds amazing! I definitely feel a greater sense of peace and calm with yoga in my life. I also am in love with yoga and do feel it is this practice that has reduced flares and many problems from my fibro. I have practiced very simple hatha yoga for 3 years. At first I wanted to be able to do more, but I realise all the stretches in this, along with the meditation aspect, provide all I need and have put me finally in a place where I can live and move more than I ever though possible after initial diagnosis. We have to learn not to “over stretch ourselves!” – I found yoga after attending a hospital pain management course, it would be good if the benefits of this could reach out to the many sufferers of this awful condition, and to know to just start very simply. I so agree!!!! I am truly amazed at what yoga has done for me and my flares. All we can do is keep singing the praises of this wonderful practice.